The Darvaza Crater, also known as "The Door to Hell," in Derweze, Turkmenistan, has been burning since it was first discovered by Soviet engineers drilling for natural gas in 1971. When the ground below their drilling rig gave way, the engineers feared the release of poisonous fumes in the environment, so the decision was made to burn off the gas. The fire was thought to burn out after several weeks, but has been burning strong for over four decades now. Trolltunga, or Troll's Tongue, is located 2,300 feet above Lake Ringedalsvatnet in Norway. The rock formation was created during the ice age some 10,000 years ago when a glacier broke off large portions of the mountain and carried them away. The Haiku Stairs, also known as the "Stairway to Heaven," were built in the early 1940s as part of an American communications network during World War II. Despite being off limits to the general public, hikers have continued to climb its rusty steps for its breathtaking views of Oahu. It was reported that a recent storm had caused significant damage to the stairway, leaving it forever unusable. When the waters of Victoria Falls at the border of Zambia and Zimbabwe reach a certain level, adventurous tourists are allowed to take a dip in the "The Devils Pool," despite the risk of falling 355 feet to their deaths below. The Cliffs of Moher are located in County Clare, Ireland, rising up to 702 feet above the Atlantic Ocean at Hag's Head. The site is one of Ireland's most iconic tourist attractions and can easily be enjoyed without driving a mountain bike off the cliff. Located in the Kjerag mountain of Rogaland, Norway, the Kjeragbolten boulder is a popular tourist destination suspended 984 meters above the ground below. The boulder is so popular that it's not uncommon to find yourself waiting in line for hours before ever stepping on this death defying photo-op. What looks to be a child's treehouse is actually a seismic monitoring station positioned to watch over the nearby volcano, Mount Tungurahua. It's there that a dangling rope swing offers tourists an opportunity to swing up and over the frightening canyon below. Dunaliella Salinas, a type of halophile micro-algae, has been know to turn Turkey's second largest lake blood-red. What's even more spectacular about the lake is also that it's home to a flock of wild flamingos! The North Yungas Road, also known as the "Death Road," has been dubbed by many as the world's deadliest road, with an estimated 200 to 300 deaths each year. According to the BBC, in just one year some 25 vehicles careened off the road and into the canyon below. That's roughly one vehicle every two weeks. The trails up Mount Hua Shan are some of the most dangerous in the world and involve impossibly steep staircases, wooden platforms pinned to the sides of cliffs, and vertical drops that'll make your stomach sink. The most popular route up the mountain was built in the 3rd to 4th century A.D. during the Tang Dynasty. 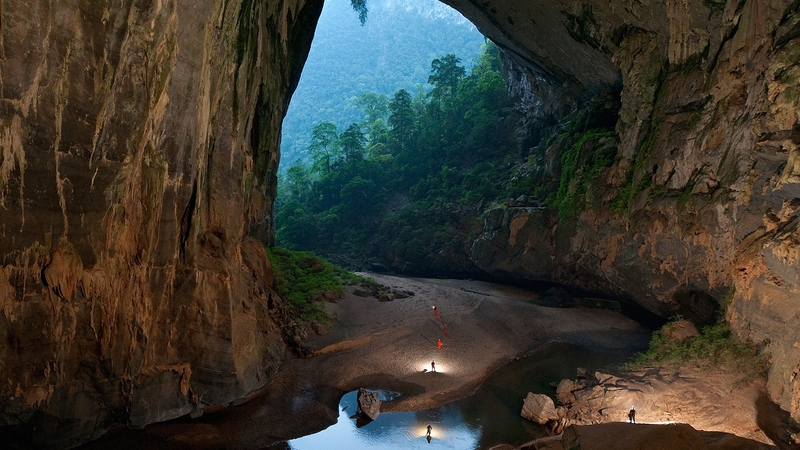 The Sơn Đoòng Cave is literally the world's largest cave and was only discovered in 1991. Nuff said. Ellison's Cave is over 12 miles long and extends 1,063 feet vertically, which is a pretty huge drop into absolute darkness. El Caminito del Rey, or "The King's Little Pathway" in English, is a narrow walkway pinned to the wall of a gorge in southern Spain. It was first used as a walkway for hydroelectric power plant workers in the area and was given its name in 1921 after King Alfonso XIII crossed the walkway for the inauguration of the dam Conde del Guadalhorce.